Hello there! I’m glad to see so many potential Spirit Hunters Inc trainees at this special briefing session. We at Spirit Hunters Inc are grateful for your attention and especially thankful that you’re considering a career with Spirit Hunters Inc to rid the world of these pesky spirits! If you decide to help us, for a very small fee we will allow you to download our special Spirit Hunters Inc software which turns your Nintendo DSi or Nintendo 3DS into a powerful spirit hunting device. As a new recruit you need to pop open your NIntendo DSi or Nintendo 3DS wherever you find yourself and hunt, battle and capture as many spirits as you can. Spirits can either be defeated (by draining their health bar completely) or captured (by trapping them with special Spirit Hunters Inc traps) when their health is low. The more spirits you defeat, the more XP you will get and the quicker you’ll level up! The more spirits you capture, the more money (in the form of Ghoulders) you will get, making it easier to afford all of the cool abilities on offer! After you complete your training battle you can start out on your spirit hunting career. Tap on Scanner and look around with your DSi/3DS. 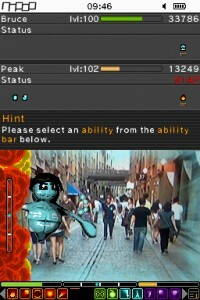 After a couple of seconds the camera will have analysed your environment and puffs of smoke will begin to appear on screen. Now you have to TAP like there is no tomorrow! Once you have tapped the smoke enough, the spirit will become angry and the battle will begin. 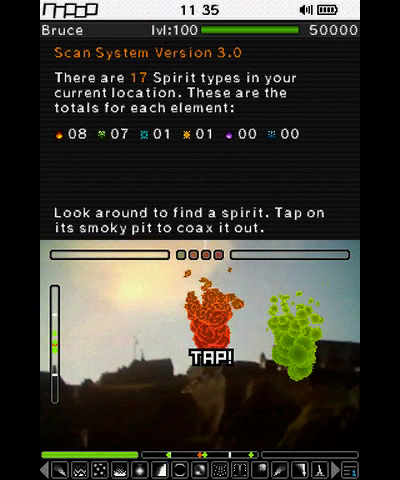 Note: each puff of smoke will disappear after a few seconds so you can wait it out if you want to hunt a spirit aligned to a particular element. Also take note that depending on your level, the time of day and the colours around you different spirits will spawn. So to track all of the spirits down you are going to need to do a bit of exploring! When the battle starts your Ability Bar will appear on screen. This Bar contains all of the abilities, items and traps you have equipped via the Inventory (so don’t forget to use the Inventory to add any new abilities when you buy them!). 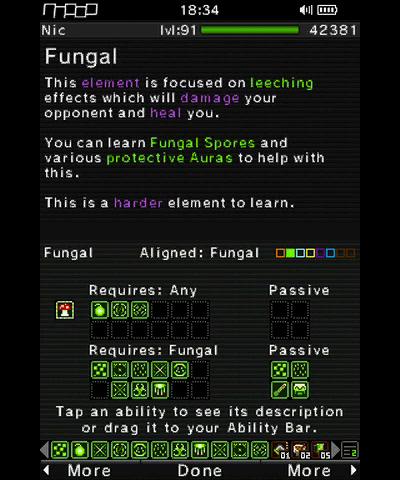 Just tap on an ability, item or trap to select it and then read the text at the bottom of the Top Screen to see what you need to do to use it. For example, with the Fire element you can flick Fireballs at your foes. So you would tap on the Fireball ability and then flick towards the spirit to fire out a Fireball! Draw a line to slash the spirit! ⁃ Watch out as some tap abilities will have more of an effect if you tap on the spirit! This spirit is about to get hit by a wall of lava! extra 30% resistance to Fire for 5 minutes. Items are used as soon as you tap on them in the Ability Bar, so be careful. Man, all this tasty Item talk has made me hungry! Finally, traps need to be placed by selecting a trap from your Ability Bar and then tapping on the screen. When you place a trap it will bob about and activate as soon as the spirit bumps into it. Your success in trapping the spirit will depend on: how weak the spirit is; how many debuffs (e.g. Slow or Blind) you have on the spirit; how big a level gap there is between you and the spirit; and how strong the trap is. You’ll get access to traps once you reach the status of Tracker, which is after you’ve completed the Level 10 rank challenge battle. Note: Each ability has it’s own cooldown timer so you will need to learn to use different abilities before the first one becomes active again. Traps and Items share the same cooldown timer so use them sparingly! OK, now we’ve covered the basics, let’s get down to battle tactics. Each spirit is aligned to one of 6 elements: Fire, Water, Ice, Fungal, Shadow, or Light. In order to battle the spirits you need to align yourself to one of these elements. 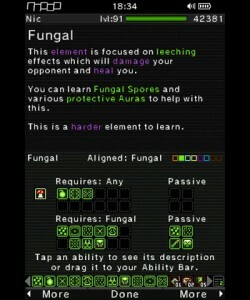 Each element has many different abilities. Some can only be used by spirit hunters aligned to that element, while others can be used by hunters aligned to any element. You choose your element at the start of your spirit hunting career and can buy new ones as you gain more experience. All Fire abilities do fire damage, however if you are aligned to Fire and buy the passive ability Burn many of your Fire abilities now have a chance to Burn the spirit. When the spirit has Burn on them they will take fire damage over time in addition to any damage done by other attacks. This type of effect is called a debuff which is a negative effect on the recipient. Warm Heart is another Fire passive ability which works in conjunction with Burn. Each time a spirit is burnt and is taking damage from Burn, if you have the Warm Heart ability you will receive healing too! This type of effect is called a buff which is a positive effect on the recipient. OK Spirit Hunters, that’s enough for one session. Join me next time when I’ll tell you about other exciting combination attacks, give advice on elemental choices and tell you about resistances and levelling up. This entry was posted on Tuesday, November 20th, 2012 at 11:39 am	and is filed under news. You can follow any responses to this entry through the RSS 2.0 feed. You can leave a response, or trackback from your own site.